one trip to the store, purchase all your ingredients and freeze in single serving portions; when you're ready just empty the bag into your blender add liquid and pulverize. I found that using a single serve blender, like the Hamilton Beach Single Serve/Personal Blender helps make smoothies an even more convenient food option. These blenders are portable so you can have one everywhere, even at your office. You can also blend and sip from the same cup, which fits nicely into most car cup holders making eating while traveling that much easier. The Tropical Green Smoothie below is an energizing mix of fresh fruit, protein packed yogurt and leafy greens. This drink is easily adaptable; pick and choose the produce you love and follow this formula: 1 part leafy greens + 1 part liquid + 1 part fruit + 1 part protein. Add all ingredients to your blender and mix to combine. I have an ongoing relationship with Stonyfield as a member of the Clean Plate Club. I receive product, coupons and compensation for posts featuring their products. As always, all opinions are 100% my own. I drink a smoothie every day for breakfast. I love smoothies and drink them several times a week! Yes, I love banana and raspberries or blueberries. We make smoothies almost every morning. No space on the counter for my large blender, either ...this one would be so handy. I love smoothies! So easy to sneak in some greens! That looks like the perfect sized blender to have at work. I can put it in my desk drawer. I love fruit smoothies, haven't tried the greens. I'll have to try your version! We drink smoothies all the time - great way to get the kids to eat more fruit and veggies! Yes, I have smoothies all the time. This smoothie sounds perfect! I think I'm going to make it this week! I need more smoothies in my life. This looks delicious. THis is such a fun little blender, it's the perfect thing for the kids to make their own personal smoothies in the mornings! I recently started drinking smoothies after the gym on weekends and loveeee them. I am definitely a smoothie drinker. Yes, I like my banana, yogurt and strawberry smoothies. i love smoothies.. i dont get to drink them as often as i want though. 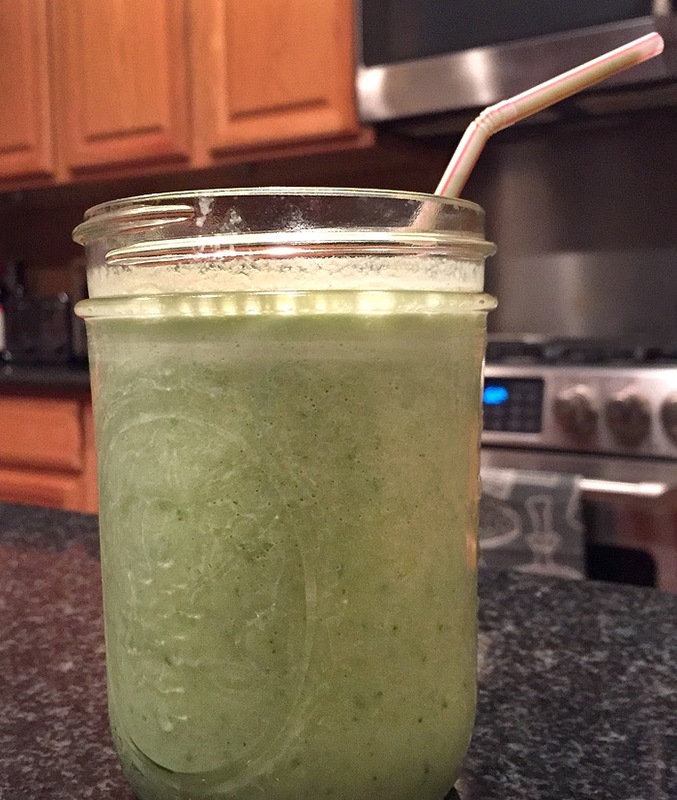 We love starting the morning with green smoothies! This looks delicious! The pineapple and coconut sound like a fantastic combination in here! I love pineapple and coconut and yogurt. I'm always adding spinach to my smoothies,I like it better than kale. I love this little blender and also the thought of bringing it to the office. Fun idea! What a great idea to divide up the fruit into single serving portions! This blender looks like it would be handy for so many things. Yes, I'm a smoothie drinker. It's such a great way to drink my fruits and veggies. Look great! Love the added pineapple! I've recently gotten into the habit of making smoothies in the morning, and I'm really loving the fact that it's an easy way to add more fruits and veggies to my diet. 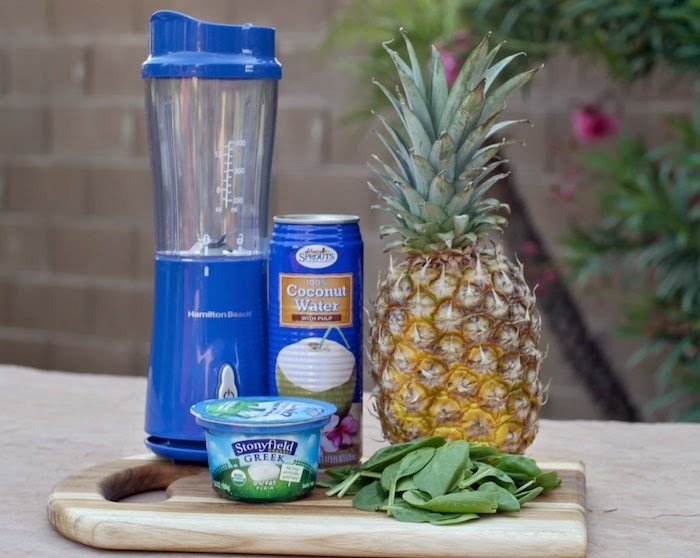 I'm always on the lookout for new combinations to add to my rotation, and this pineapple, spinach and coconut combo sounds perfect! I like to drink them as long as they have a banana in them. I like the texture it adds. I've been having smoothies for dinner! So much better to have my small meal at dinner time! Love this smoothie and that blender! This smoothie looks so good! I love whipping them up for breakfast and even sometimes dinner. I love the idea of having a mini personal blender at work or for travel - definitely a great way to have your smoothie wherever you go! At my last job, we had a personal trainer come in two days a week, and he'd make us delicious smoothies after our work-out. I don't make smoothies at home, because I don't have a blender -- which is why I'd love to win the giveaway! I can't remember the last time I made a smoothie. I like the idea of having a mini personal blender too. Maybe I'd drink them more! I need a new blender! And I love smoothies!! I am definitely a smoothie drinker - my 16 year old and 18 month old are huge smoothie fans too! Yes, I love them! They taste so great. I drink premade smoothies, and should start making my own to save money. I love smoothies! strawberry banana is my favorite. I drink smoothies all the time. I had one this morning. Yes but I don't have a blender. I am a smoothie drinker! Yes, I love breakfast smoothies. I love smoothies. I have one for breakfast each morning and sometimes at night! I love smoothies and so does my son. We usually make smoothies for lunch and my son enjoys pushing the button and watching it work. My green drink doesn't mix well with cocoa though (at least for my taste buds). The taste is as good as I'm assuming to be – though Green supplements does give amounts of everything that is in there.